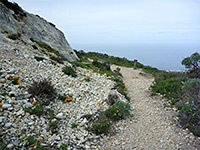 While most footpaths in Montaña de Oro State Park lead to the shoreline, across coastal bluffs or along inland ravines, a few penetrate further east into the backcountry and climb ridges to four summits, which in order of increasing height are Hazard Peak, Valencia Peak, Oats Peak and Alan Peak. 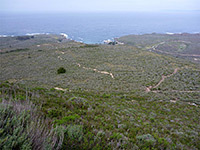 Of these, the second is the most popular destination as it rises steeply just one mile from the ocean and is reached by a relatively easy trail of 1.9 miles: the two higher summits are one and four miles further inland so have more limited views of the coast. 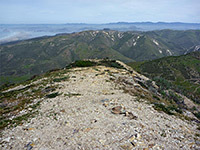 There are no trees anywhere on the slopes of 1,347 foot Valencia Peak and hence nothing to block the vista, which from the summit is said to extend up to 90 miles on clear days (not common), but even when somewhat hazy or misty the view is quite spectacular, encompassing the often rocky coastline north across Morro Bay to the distant Estero Headlands and south towards the closer hills near Point Buchon, and including many square miles of rolling grassy terrain to the east. 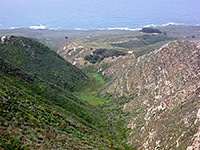 Map of Montaña de Oro State Park. 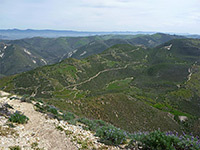 The Valencia Peak Trail begins from a parking area just south of Spooner's Cove, the main center for visitor activities in the state park. Nearby Holloway Garden contains a collection of several dozen native wildflowers and bushes. The wide, well used and easy-to-follow route first crosses a fairly level, bushy area, past a junction with the lightly traveled Rattlesnake Flats Trail to the foot of a ridge, then switchbacks above a ravine to a bench, soon followed by a shorter ascent to a second bench, and finally a steeper section up to the summit. Two side trails branch off on the first bench, north towards the campground and south (Badger Trail) round the head of a little valley and eventually back to the road. The slopes of Valencia Peak bear many wildflowers in spring, most prominent being lupinus arboreus, the tree lupine, which forms clumps several feet high and broad. 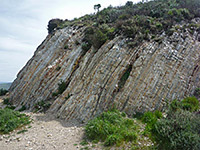 Some parts of the upper portion of the trail are a bit rocky, while other places have loose stones but the hike presents no real difficulties and the round trip can be done in not much more than one hour.